The Royal Enfield Tank Painting makes motorcycle making into a fine art. The detail and craftsmanship these workers put into each bike tank takes patience and a steady hand. For anyone who underestimates the decoration of these Royal Enfield motorcycles, these videos will prove just how difficult this craft can be. The entire design is done freehand, making any wrong move completely ruin the beautiful artwork. Symmetry is of utmost importance when making each brushstroke, and these employees do an amazing job eyeballing the exact measurements for every line. Motorcycles are not usually associated with fine art and graphic design, but this Royal Enfield Tank Painting demonstrates that this motorcycle company has expanded into this realm of craftsmanship. 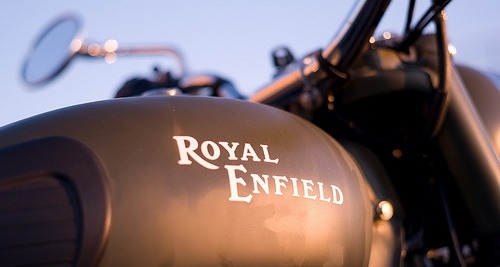 Ride with class and style with these Royal Enfield motorcycles and their handcrafted wonders. Implications - In contemporary society, many consumers are looking to individualize their purchases. Putting handcrafted paintings on motorcycles is one way to gain attention from buyers, as this can be altered to fit a variety of customers looking for a more personalized look. Observe his technique closely, and you'll notice his right hand—the one holding the brush—moves through space as propelled by his entire body, but it barely ever moves in relation to his body; he locks his hand, arm and torso into a particular shape and keeps it there, using his legs and waist to create slight but precise motion. He then manipulates the tank with his left hand as the brush makes contact. This is like holding your paintbrush steady and moving the canvas around beneath it, and even more impressive because he's doing it in 3D space. I've watched the video over and over again, and I find it mind-blowing. With those hands and a different roll of the dice, this guy would've been a neurosurgeon. if that dude came to australia, he'd be paint a freaking shitload! get him painting all the cars doing custom work.﻿ pure awesome!